WICHITA FALLS, Texas – November 27, 2017 – Marksmen Firearms & Outfitters is about to open its largest store in the heart of Wichita Falls on Saturday, December 2. Marksmen has four other stores in Benbrook, Granbury, Killeen and Mansfield, Texas. “New businesses and increased competition are signs of a growing economy, and that’s exactly what we have with this new Marksmen store. More choices mean that both citizens and visitors are more likely to spend their dollars here. 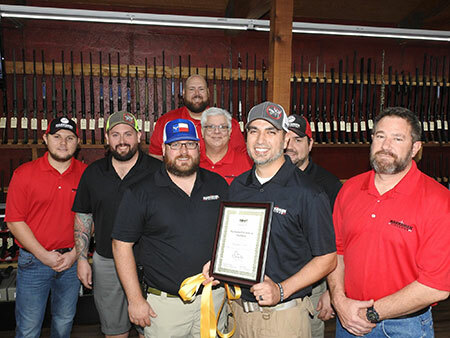 We are extremely excited to have Marksmen join the Chamber and be part of our growing business community”, said Wichita Falls Chamber President and CEO, Henry Florsheim. On grand opening day, customers will typically be lined up around the building waiting for doors to open for their hourly gun giveaways and opening day specials. KLUR, The Outlaw and The Bear will be on site doing live radio remote broadcasts and there will be plenty of free food and prizes. “This city holds a special place in the heart of our owner, who was raised in Wichita Falls. There are a lot of hunting and fishing enthusiasts in this part of North Texas, so our goal was to carry the largest selection of firearms, ammo, accessories and fishing tackle within 100 miles. Our knowledgeable staff will be there to help customers whether they want to buy, sell or trade. We also do all our own gunsmithing in-house”, said Joey Dello Russo, Vice President of Operations. The newest Marksmen Firearms & Outfitters is located 4300 Kemp Blvd., across from the Sikes Senter. The grand opening will be from 10 a.m.- 7 p.m. on Saturday, December 2. Normal store hours will be Monday-Saturday, 10 a.m.- 7 p.m. For more information, visit www.marksmenfirearms.com or follow them on Facebook at Marksmen Wichita Falls. Marksmen Firearms & Outfitters is a corporate property of AngMar Retail Group, headquartered in Mansfield, Texas. The retail group also owns and operates Fat Daddy’s Sports & Spirits Café, Smokey MAE’s BBQ, Southern Oaks Golf & Tennis Club, AutoWorx and House of Hotrods. The company is scheduled to open another Fat Daddy’s Sports & Spirits Café in Fort Worth early next year. There are also plans for a new Marksmen store and gun range in Mansfield and a new restaurant concept, Mama Angie’s Mexican Cocina, in 2018.